It is important for us to emphasize is that we use robots just as tools to eliminate repetitive tasks. Modern robots can surpass humans in some procedures, but in tasks such as hiring, humans still hold the edge. Edited Excerpts from his interview. Q- What is the value of Wellness of your workforce? What steps are you taking for it in your organization? Employee wellness at Uflex is not just a nice to have factor, it is the key to keeping employees engaged and productive. I have always believed that higher productivity is brought about when employees enjoy a heightened state of mind and body. Thus we have always given utmost priority to employee well-being. At Uflex, we do multiple activities to help employees stay fit & healthy. We have our medical doctors in each of our manufacturing locations, we provide free regular medical check-ups, organize eye camps and distribute free of cost spectacles, organize health talks by specialist doctors etc. We also put special emphasis on providing wholesome meals to our employees in cafeteria across plants. 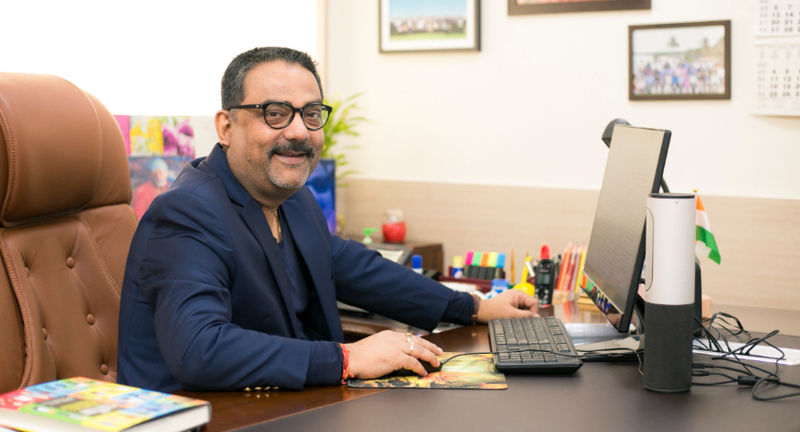 An inspiring workplace, as per me, is one where an employee looks forward to come, work, engage, enjoy and put his best efforts to pursue a compelling vision of the organization. At Uflex we do multipronged things to make our workplace really inspiring; it flows from our leaders and vision of our inspirational Chairman which motivates Flexians to give their best. We work across themes such as working environment, performance & growth, pride & say, employee communication, training & development etc. to ensure that we create an inspiring workplace. For e.g. we recently presented the findings of our engagement survey - INSIGHT 2018 to our leadership team, one of the interesting insights of the survey was our high score on the R&R theme. This is result of our relentless measures to address this theme. Apart from having business specific R&R programs, we brainstormed and designed Corporate R&R program ‘Pratishtha’ that provides an opportunity to each and every Flexian to showcase their talent. We have six different categories of awards under Pratishtha ranging from individual awards to team awards, business leader awards etc. The most prestigious amongst them is CLAP club wherein the winners get an opportunity to travel abroad as a part of their reward. Q- Can we leave an important decision as hiring on a Robot? I must say that role of HR is evolving as a result of digital disruption. Technology today is changing the way we interact with people all across our lives and hiring is definitely no exception. Although robotic technology has made enormous strides, there still needs more attention to be directed at developing cooperation between humans and robots. People have their strengths, and so do robots. What is important for us to emphasize is that we use robots just as tools to eliminate repetitive tasks. Modern robots can surpass humans in some procedures, but in tasks such as hiring, humans still hold the edge. Q- What are the challenges of working with instant gratification seeking millennial? Millennials literally hold the world in their hands and have done so from a very young age. They are accustomed to having questions answered quickly, acting on that knowledge immediately and receiving feedback on demand. We at Uflex are experiencing a historically unique situation: four generations working side by side throughout the organization. Twenty year old new hires find themselves interacting with colleagues who are older than them by 50 years or more. This analogy has helped us in launching our Mentoring process wherein the senior leaders of the organization are assigned mentees especially millennials, this has proved to be beneficial in building a learning environment, it encourages knowledge sharing and builds productive internal networks. Gen Y have its own values, work styles, and expectations — and having team members from three or even four generations trying to navigate such differences while working on the same project team can create the conditions for a perfect storm, but those same differences, if properly monitored, coached, and steered, can also drive collaborations that yield unprecedented success. Q- How should a CEO and CHRO bridge the skill gap? Skill and innovation gaps pose a serious challenge to the organizations these days. Leaders must address these gaps to sustain and raise organizational competitiveness. At Uflex, we have a robust recruiting platform that facilitates a structured hiring process and offers options that best fit the organization. We focus on targeted selection interviewing process and evaluate candidates competencies based on their past behavior. While applying this process, we specify all the critical requirements of the job which includes skills, qualities, knowledge and behavior required for the job. Before starting our interview process, we meet the CEO, functional heads and key leaders of the specific business to hammer out which skills/priorities are most important for success. Post this, we work to create a concrete list of assessment benchmarks based on the competency framework of the business and then evaluate all candidates methodically based on consensus check-list. Q- What do you think are the expectations from a futuristic CHRO? Futuristic CHRO will essentially be both – a People’s leader and a Business leader. S/he will have to perceive her/his role as embedded role inherent in the business planning, execution, review and growth. S/he will essentially need to have business acumen, financial acumen and would be data-savvy. Futuristic CHRO would be required to be the first go-to person for a CEO and would invariably be expected to lead in a crisis situation. Data and analytics will definitely help CHROs to see new directions and can bring better perspectives. However, the data alone is not enough. CHROs will have to take those insights from the data and apply foresight – using their experience, wisdom, and judgment. With this combination, great things can happen. Q- What are the best practices that CHRO’s are leveraging from Social Media for the right kind of hiring and recruitment? Recruiting with social networking is fast becoming a way of life. It has opened up new paths of hiring and revolutionized the exchange of information. Sites like LinkedIn, Facebook, Twitter etc. have offered a tremendous opportunity to connect with candidates many of whom would never be found through traditional sources. While it seems like a no-brainer in today’s economic climate, there is an inherent problem with relying on social media and the Internet in general to find a perfect match. I personally believe that it is simply not a sustainable strategy in terms of future growth as the pool of high-skilled, professional and specialist candidates will inevitably shrink as domestic and international economies rebound further, finding the best possible employee will prove to be a lot tougher than throwing a few keywords into a social media search engine. Q- A job interview is a conversation between two liars, how to get the best out of that is the skill of a CHRO. Can you give us some hacks for the same? At Uflex, we have a robust recruiting platform that facilitates a structured hiring process and offers options that best fit the organization. We have 6 different business verticals and all the businesses have their own defined competency frameworks. As a part of the interview process, every candidate is evaluated on the business specific core, level and behavioral competencies. We have been conducting these interviews to fill positions across levels now and have found it be very successful in gauzing the maximum out of the candidate. Q- Explain the fine line between Talent Acquisition (TA) and Hiring? I would compare them on a long-term planning and short-term action approach. Both approaches may be used depending on the circumstances, TA tends to be strategic in nature and hiring on the other hand is tactical. Talent acquisition tends to focus on long-term human resources planning and finding appropriate candidates for positions that require a very specific skillset whereas hiring is limited to filling vacancies. Q- How to keep your employees motivated in a crisis situation? In any crisis situation, it is important for the leadership team of the organization to lead by example. The senior leaders of the organization should remain motivated and most importantly visible & involved. They should convey a positive vision about the future of the company and should act as a strong pillar of support.